Sometimes I ride to work, sometimes I drive. Today I drove, and coming down Kellogg into downtown Saint Paul the rush hour traffic was all jostling to move into the left lane. I let a school bus move in front of me and could see the reason ahead; a policeman stopped in the right lane with a cyclist standing next to the cop car. 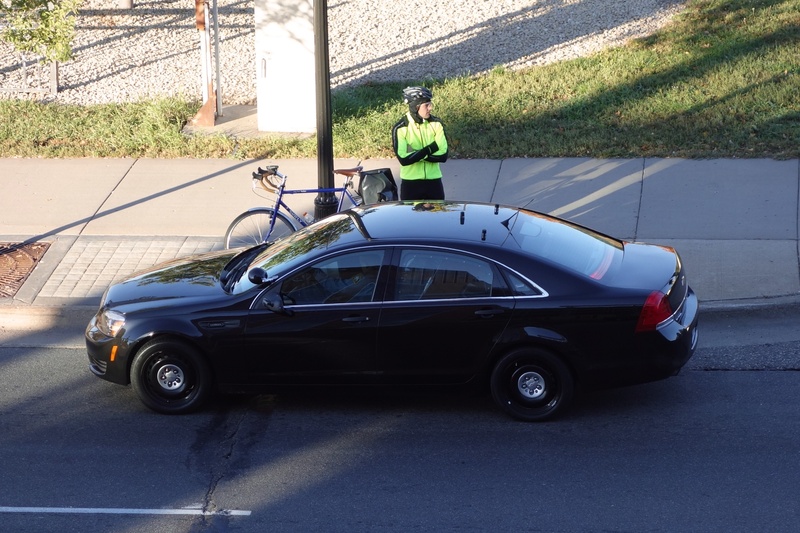 I thought at first maybe there'd been a crash, and he was involved, but as I came alongside and then turned, the cyclist looked fine, there were no cars stopped, and the guy was rooting around in his pannier as the cop looked on. I parked in the adjacent parking ramp and took this photo. The cyclist looks like a pretty standard-issue Twin Cities commuter: Surly Long Haul Trucker, fenders, Brooks saddle, Ortlieb bags. I think he got stopped for some traffic violation. He sure looked annoyed. I don't know what he did. Speeding? It is downhill. Run a light? Perhaps. It's an unmarked car, would be easy not to notice. Whatever it was, the cop thought it serious enough to pull him over and then plug up one lane of traffic on one of the busiest roads into downtown at rush hour. Protecting and Serving, you know.